neat things for doors, windows, etc. as above. I could not find a performance of it, our teen groups always liked this one. Divide into groups as needed. It can be a challenge competition and timed as well. Again, work with what you need to accomplish. Let the building begin. You can talk as they build, or interact in the building and wait until the water test to talk. HOUSE: They are building a house on a foundation. The house is their Christian testimony, their life, their Character in Christ. You can add to this part by adding in the “Beatitudes” in Matthew 5, also known as the ‘attitudes to be’. Jesus Christ our Lord is the Rock, the foundation on which their Christian Character and testimony are built. 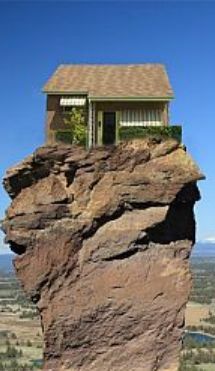 Luke 6:48 says, ” he is like a man building a house, who dug deep and laid the foundation on the rock. And when a flood arose, the stream broke against that house and could not shake it, because it had been well-built.” A good foundation is firm, deep. Building on anything else may be simpler but certainly will not last the test of time. So they are building their life based on a right relationship with Christ, their Rock. They will face temptations and trials but because they are built upon the Rock, they will not be swayed by winds that bring the rains. There will be false teachers, people who teach things that are not in God’s word. · Ephesians 4:14-15 “Then we will no longer be infants, tossed back and forth by the waves, and blown here and there by every wind of teaching and by the cunning and craftiness of men in their deceitful scheming. 15Instead, speaking the truth in love, we will in all things grow up into him who is the Head, that is, Christ. Building on the sand are those that ignore the Lord, His teachings and His will in their life. They rely on themselves and the world, its beliefs and ideas. Once all the houses are built and ready for the water test, you can begin with a slow sprinkle and list things that come in life. Bad grades, broken toy, lost of a pet, breaking up of a friendship, etc. Increase the water flow and as the twigs and sand and houses break apart, tell them that the water is the hard things in life-like death of a family member, dad losing his job, someone being very sick, someone telling lies to them (relate to your child what they are going through). The lesson learned: Without Christ as your foundation, the struggles of life will tear you down and destroy you. You must build your life each day on the solid foundation, the Rock, the Lord Jesus Christ and you must use His character to build the walls of your life so that when trials, temptations and troubles come, and they will, they will stand firm like their Rock.